Note: The Book of Galatians was written following this Jerusalem Council. Galatians was written to answer these questions once and for all. See the notes on Galatians by clicking here. Paul and Barnabas have been preaching and discipling in Antioch, just north of Israel in Syria (about 300 miles north of Jerusalem), when they get some visitors to lend them a teaching hand from Judea. Notice what these guest lecturers taught in verse 1, "Except ye be circumcised after the manner of Moses, ye cannot be saved." Keep in mind: the church was a new entity here, fifteen years or so old. It started with a virtually all-Jewish congregation on the Day of Pentecost in Acts 2 in Jerusalem. So, at that point in time, all the men in this new church had been circumcised according to Jewish law. These people were having considerable difficulty reconciling the place of Gentiles in this new entity, the church. Previously, if you wanted to become a Jew, you had to undergo the rite of circumcision. So, it was understandable that many in the church in Jerusalem were still convinced that this would be a necessary ritual for those wanting to become part of the church as well, even if you were a Gentile. In their minds, accepting Jesus as Savior included accepting Judaism as a foundation for one's faith. They viewed Christianity as a layer built upon Judaism. Then we see a reality that really complicates this discussion in verse 5. Right there in the church of Jerusalem were Pharisees who had gotten saved, but retained their affiliation as Pharisees. They were particularly adamant about the fact that salvation required not only baptism, but circumcision as well. Not only so, but add to that the observance of all Jewish law by these new Gentile converts. So, the first Jerusalem Council is called to order to discuss the question of reasonable requirements for these new Gentile Believers. Do we require them to be circumcised? Do we require them to keep the rituals of the Law of Moses to which they have never been exposed before? Incidentally, many Believers today are convinced that Christians are obligated to keep the Ten Commandments. Ironically, they categorically disregard the strict mandates of the fourth commandment (Sabbath keeping i.e. Saturday) without even acknowledging that they skipped one. For more information on this rejection of the fourth commandment, click here. Pay close attention here to the decree issued from this Council of Jerusalem. You will see that the Gentile Believers were NOT to be bound by the Law of Moses, including the Ten Commandments. Since it is stated so clearly here, how is it that so many Believers today are confused about the role of the Ten Commandments in Christianity? The year is around 49 A.D., about the same time Paul wrote Galatians. Of course, Paul and Barnabas went to Jerusalem to participate in this discussion. After all, they had been responsible for preaching to countless Gentiles who subsequently had gotten saved. Peter was there also; he had won the first Gentile converts after Pentecost when he went to the household of Cornelius in Acts 10 (see notes). Peter makes a great speech with an excellent point in verse 10, "Now therefore why tempt ye God, to put a yoke upon the neck of the disciples, which neither our fathers nor we were able to bear?" Then in verse 12 it was time for Paul and Barnabas to report to them about all the Gentiles who had gotten saved along with the accompanying validating miracles. We aren't given any additional details regarding their words. Finally, James (verse 13) stands up to pull it all together. He refers to Peter's presentation of the Gospel to the Gentiles back in Acts 10 (see notes), but makes no mention of any points made by Paul or Barnabas. He makes his strongest case by quoting (well...sort of) Amos 9:11-12 (see notes) regarding the prophecy that Gentiles would be included in the Davidic Kingdom. Then James recommends a course of action in verses 19-20, "Wherefore my sentence is, that we trouble not them, which from among the Gentiles are turned to God: But that we write unto them, that they abstain from pollutions of idols, and from fornication, and from things strangled, and from blood." He suggests the reasoning for such a decree in verse 21, "For Moses of old time hath in every city them that preach him, being read in the synagogues every sabbath day." In other words, these Gentiles need to be considerate of the Jews in these Gentile cities, a suggestion which they agree to formalize and publish. Though written down and distributed, it hardly settles the issue, as we will see in the remainder of the Book of Acts, as well as in the Epistles of Paul later on. So what do we require from these Gentiles who have gotten saved? Many of them are completely unfamiliar with the requirements of the Mosaic Law. They've never even heard of the Ten Commandments. Please understand, these Gentiles were likely ignorant on everything Jewish. The battle lines are drawn. On the one side you have the born-again Pharisees who want them to become Jewish proselytes as a prerequisite to becoming part of the church. On the other hand, Paul and Barnabas say to just leave them alone; there's nothing in the Law of Moses that pertains to them. James actually acknowledges the Gentile exemption from keeping the Law of Moses in verse 24 when he refers to the false doctrine that had been taught to the Gentiles, "Forasmuch as we have heard, that certain which went out from us have troubled you with words, subverting your souls, saying, Ye must be circumcised, and keep the law: to whom we gave no such commandment:" James comes up with a compromise. Make no mistake about it; it was just a compromise. We'll see in Acts 21:15-26 (see notes) that it really didn't settle the issue for the staunch legalists in the church with regard to Paul's ministry, nor did it settle anything for Paul and Barnabas; they more or less go on to disregard the content of this compromise after this council, although we do see in Acts 16:4 (see below) that Paul was faithful in citing it immediately after departing from Jerusalem to embark on his second missionary journey. However, what Paul wrote in I Corinthians 8 (see notes) and the continuation of that discussion in I Corinthians 10 (see notes) some ten years later regarding meat offered to idols completely disregards the ruling of this council. Give James credit though, he did exercise great statesmanship in holding together this alliance of such diverse Believers. You will notice how carefully worded is the letter James wrote regarding this issue in Acts 15:29, "That ye abstain from meats offered to idols, and from blood, and from things strangled, and from fornication: from which if ye keep yourselves, ye shall do well. Fare ye well." It strikes me as interesting that James falls short of declaring these new suggestions to be laws for the Gentiles to observe. He simply concludes that in observing this subset of Jewish-law restrictions, they would "do well." Paul and Barnabas are then accompanied by two others (Judas and Silas) as witnesses of the Jerusalem council's decision. One of these witnesses, Silas, later accompanies Paul on his second missionary journey, as we see in Acts 16 (see below). This Silas is the same individual identified in Paul's epistles as Silvanus (II Corinthians 1:19, see notes; I Thessalonians 1:1, see notes; II Thessalonians 1:1, see notes; I Peter 5:12, see notes). Their first stop is Antioch, a long trip from Jerusalem way up in Syria - about a 300-mile trip. They immediately gather the converts there and deliver the official message from Jerusalem. Let me offer one more admonition regarding this event in the whole context of the Book of Acts. This book is an accurate account of the events of the early church. That does not mean that everything that was done and said by Godly men is to be emulated and practiced by us. We are to always use the Epistles of the New Testament to validate practices in the Book of Acts. Here is a prime example. The Jewish practice mentioned here of abstaining from blood makes it completely unacceptable for one to eat a steak cooked rare. This restriction pre-dates the Law of Moses all the way back to the covenant God made with Noah in Genesis 9:3-4 (see notes). You'll never catch a practicing Orthodox Jew eating a rare steak! However, in the time in which this was written, this compromise was designed to cause as little offense as possible by the Gentiles toward the Jews. Don't take this as doctrine for all time; enjoy your steaks the way you like them cooked! Most of all, read the Book of Acts in context...just like you read the activities of God-fearing men in the Old Testament in context. They didn't always do or say the right thing, but a lesson was always learned. For more information regarding the proper way to view the Book of Acts, click here to see the introduction to the Book of Acts. One more thing: Notice that these Gentile Believers were exempted from keeping the Mosaic Law, including the Ten Commandments, as a result of this decree from Jerusalem. Paul wants to revisit all the churches that have been established. Barnabas wants to take John Mark along, but Paul says "no." As a result, Barnabas and John Mark head out to minister together, and Paul picks up Silas as his ministry companion for his second missionary journey. 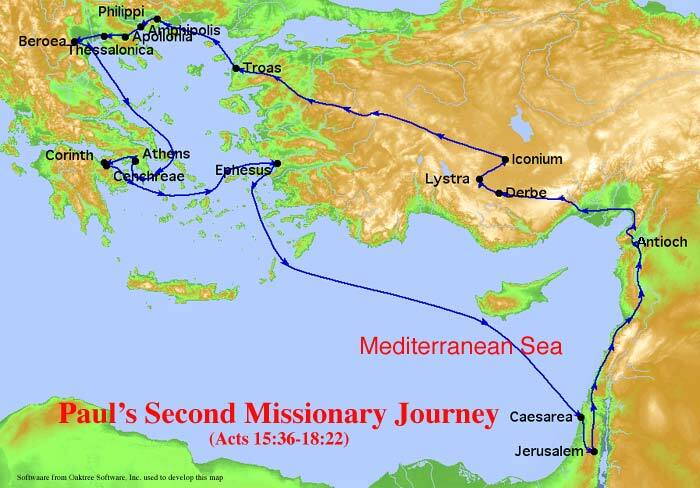 See the map on this page for Paul's second missionary journey. However, there seems to be more to the story regarding the split between Paul and Barnabas here. Let's note some of the information we know about John Mark. It is generally accepted that John Mark was the writer of the Gospel of Mark. According to Colossians 4:10 (see notes), he was the cousin of Barnabas. Peter refers to him as "my son" in I Peter 5:13 (see notes) - an indication that Peter may have been the one who led him to the Lord. John Mark first began accompanying Paul on his first missionary journey in Acts 12:25 (see notes), along with Barnabas. John Mark left Paul and Barnabas in Acts 13:13 (see notes). This was just prior to an intense concentration of ministry focused on Gentile salvation. Barnabas had withdrawn from Paul and the Gentiles in Galatians 2:13 (see notes), an action for which Paul criticized both Peter and John Mark. At this point in time, Paul and Barnabas are back in Jerusalem before the council. It has been two years or so since John Mark left Paul and Barnabas. Now, John Mark wants to rejoin them, and Paul is absolutely against it. Could it be that Paul could not get past the failure of John Mark to be loyal to the ministry back in Acts 13 when he left. Could it be that John Mark, a Jew, had left Paul and Barnabas back in Acts 13 because of a disapproval of their intense ministering to Gentiles instead of Jews? Perhaps so - and now Paul does not want him back on the ministry team. Timothy was a great find, and he wanted to accompany Paul and Silas on their missionary journey. There was a problem though. Timothy was not Jewish. His mother was Jewish, but it was traditionally the father that determined one's heritage. Moreover, Timothy had been raised as a Greek without the rite of circumcision. Realizing that this would be a detriment to reaching Jews for Christ, Paul, being a Pharisee, takes Timothy through the proselyte ritual to Judaism which included circumcision. Now Timothy, as a Christian missionary, also fulfilled the Jewish expectations of those who were still insistent that the gateway to Christianity was through Judaism. You must understand, this was done for the sake of testimony; it was not done as a mandate for Christians to keep Jewish law. We see here that Paul, Silas and Timothy head through predominantly Gentile cities preaching the Gospel. They are now armed with the decree of the Jerusalem Council (15:29, see above) which exempts Gentiles from having to go through the Jewish passage before becoming Christians. Notice verse 4, "And as they went through the cities, they delivered them the decrees for to keep, that were ordained of the apostles and elders which were at Jerusalem." For the first time, Paul was able to preach to the Gentiles the unfettered Gospel with the formal blessing of the Jerusalem Church. While on his missionary journey, Paul has a dream, "Come over into Macedonia, and help us." That's enough for Paul; it's off to Macedonia, a Roman province lying north of Greece. This is way north and west of Paul's trip into Asia Minor. This is the area where Philippi and Thessalonica are located. Lydia was a business woman - sold purple dye. After getting saved, she offers Paul and Silas lodging there in Philippi. God is good. Well, it turns out that the Romans in Philippi aren't too keen on Paul and Silas either. So here's a gal who was demon possessed, enabling her to successfully engage in fortune telling. She continues to follow Paul and Silas around proclaiming the truth: "These men are the servants of the most high God, which shew unto us the way of salvation." After a few days of this, Paul's had enough and commands this demon which enabled her to tell fortunes to leave her. Management is very unhappy - beats them and throws them into jail as disruptive Jews. While in jail, there's a big earthquake - not just any kind of an earthquake, but one that causes the jail doors to open and their binding chains to fall off. This makes the jailer suicidal. Not to worry - nobody leaves. The jailer is so touched by this incident, he asks to be saved and takes them home to meet the family, all of whom also get saved. The next day the officials practically have to beg Paul and Silas to leave the jail and to leave town. Paul had pointed out that he was beaten without cause...and he was a Roman citizen. These Roman officials were anxious to have this legal misunderstanding out of the way. After some goodbyes, they do leave town. Now that's a success story! In Thessalonica, Paul just preaches his standard message about Christ being the Messiah. He gets some converts there, but the influential Jews stir up a mob against them, who subsequently assault the home of their host, Jason. These Jews falsified their testimonies though - said that Paul was teaching another king besides Caesar. You must admit, that was quite hypocritical on the part of those jealous Jews to take the Messianic teaching, to which they subscribed, and use it against Paul and Silas. It results in the mob trial of some of Paul's converts. They finally let them go, but due to the controversy, it was time to move on. They get a better reception in Berea, but those pesky Jews in Thessalonica hear about their success and send people to stir up the Bereans as well. Silas and Timothy stay, but Paul takes off for Athens. Paul makes a hasty departure from Berea and instructs Silas and Timothy to join him as soon as possible. They don't actually join him again until Paul reaches Corinth in Acts 18:5 (see notes). Paul begins his ministry in Athens by going into the synagogues and preaching to the Jews. It's not long, however, before the Greeks in Athens become extremely curious about this new message of Jesus that Paul is preaching. They want in on the action. Athens: the capital of Attica, the most celebrated city of the ancient world, the seat of Greek literature and art during the golden period of Grecian history. Its inhabitants were fond of novelty (Acts 17:21), and were remarkable for their zeal in the worship of the gods. It was a sarcastic saying of the Roman satirist that it was "easier to find a god at Athens than a man." Epicureans were followers of the Greek philosopher, Epicurus who died in 270 B.C. He was an atheist who taught men to seek, as their highest aim, a pleasant and smooth life. The founder of the Stoics (Stoicks) was Zeno (300 B.C.) He taught that a man’s happiness consisted in bringing himself into harmony with the course of the universe. In practice, they were trained to bear evils with indifference, and so to be independent of externals. In the process of his preaching, Paul's ideas are realized to be new material to the philosophy-hungry Athenians. He is then asked by the Epicurean and Stoick philosophers to appear before the Areopagus, the council that met in the open air on Mars Hill. He addresses the issue of their superstition. They had studied philosophy and reasoned for centuries to the point that they really had no core beliefs any longer - too smart for their own good. By the way, you gotta love Paul's introduction to these Greek philosophers in verse 23, "For as I passed by, and beheld your devotions, I found an altar with this inscription, TO THE UNKNOWN GOD. Whom therefore ye ignorantly worship, him declare I unto you." Paul says, "Hey! I know your "unknown God." Then in verses 24-31, Paul zips through several of their principles of philosophy demonstrating that, while they have questions, Jesus is the answer. He gets mixed reviews on his message...with some converts (verse 34). The good news is that nobody tried to stone him when he preached the truth there. Besides, these Athenians were too sophisticated to act violently toward new knowledge. It is obvious that their god had become philosophy. Incidentally, notice verse 26 as Paul makes reference to the activities of God, "And hath made of one blood all nations of men for to dwell on all the face of the earth, and hath determined the times before appointed, and the bounds of their habitation." Paul was undoubtedly referencing the Song of Moses where in Deuteronomy 32:8 (see notes) the song says, "When the most High divided to the nations their inheritance, when he separated the sons of Adam, he set the bounds of the people according to the number of the children of Israel." In other words, Moses' song proclaims that the dividing of the nations facilitated the apportionment of designated land for his chosen people, Israel.